A successful recycling program starts with a plan that will get your building’s occupants to build healthy recycling habits. If you make recycling easy for them, then your success rate will be much higher. Recycling stations (individual round receptacles connected to form a cohesive modular unit, as seen above) stand out because they become much more than a recycling area. They become recycling destinations that are well organized and configured with ample capacity. A fully functional, attractive station will draw more attention. 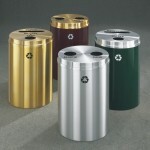 Half round recycling receptacles organized as a station can also be used to draw attention by placing them against walls, in hallways and in public areas. They are a great way to maximize visibility in tighter spaces to complement recycling stations you may have in place. Half round or wall mounted half round recycling receptacles are low profile, but they also enable you to promote recycling in places that full sized recycling receptacles may not fit. Recycling receptacles can be more than functional—they can be used to enhance a facility’s décor and coordinate with existing furnishings. By using finishes that will ‘pop,’ company logos, custom messaging and even signage, you will be able to attract more attention to your recycling receptacles. Companies like Glaro Inc. offer a broad selection of sizes, shapes, designs and finishes so that you can really make your receptacles stand out without being locked into limited, monotone options. 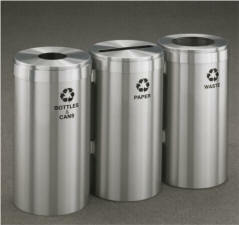 The receptacles are also all-metal, creating a distinguished look with a sheen. They offer a more sophisticated alternative than most other products on the market. You can even mix and match the colors of receptacle tops and bodies. Or, you may choose to match existing finishes seen in your building. Last month, we shared common places that you should be placing recycling receptacles in order to maximize visibility. You can learn more about them here: http://glaro.biz/2014/07/29/the-8-essential-places-every-building-needs-to-have-recycling-stations. Remember: Implementing a first class recycling program that will gain traction is possible when you invest in the right products that show how much you support the cause.